We have just returned from great events at The Royal Berkshire Show and Alchemy Music Festival. Both events were very enjoyable with lots of interest from the public. The only annoying aspect of exhibiting our work at public events is when people blatently copy our work. At Newbury we had another basketmaker who after seeing our hearts and stars on sale suddenly started making them and undercutting our prices. Yes we saw them sneaking around looking at our stuff without speaking to us. All's fair in business so they say. 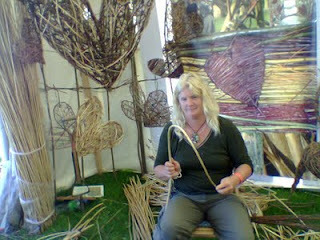 Likewise I had another lady who 'has done a bit of willow weaving' taking close-up pictures of our work without even asking. We know that there is not much unique in the willow world but we are alway surprised at how unapologetic and cheeky the would-be copists are. Would you believe that we have had people pick up one of our £1.00 willow stars, closely examine it, do a sketch and then put it back. They don't even have the grace to give us a quid for stealing an idea. 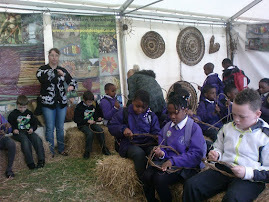 The most amusing thing so far is an email from a Wildlife Trust who expect us to provide them with willow and details for some school projects that they intend to do instead of hiring Willowpool Designs. We have had to rescue many poorly built living willow projects created by staff of environmental charities using free volunteer labour and no expertise. We do work with some environmental charities who recommend us for Living Willow Work but some groups are now beginning to offer the services that we provide themselves with little knowledge or experience. We are still available for booking for Living Willow Sculpture and suggest that any school wanting to improve their outdoor areas by creating willow tunnels, domes, mazes and arbours contact us and not environmental charities with inexperienced staff.